Kayak: The Google Of Travel? 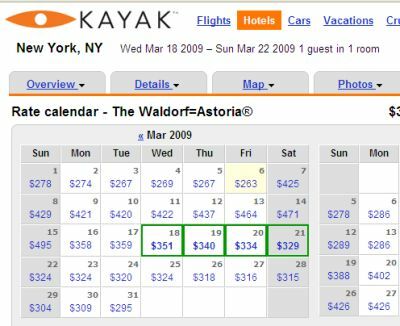 The Waldorf-Astoria’s under $300 on Mondays. What a deal! Kayak’s gone ahead and added a handy new feature called a “rate calendar,” a calendar (appropriately with rates) that breaks down the average price of a room by day for you right-brain visual people. I have to credit Budget Travel with scooping this story, but of course they were granted an interview with Kayak himself, probably a thrilling meeting for all those involved and what I would guess included complimentary Diet Cokes and liberal use of Kayak’s conference room during the allotted hour. Come on Kayak, hook TheExpeditioner.com up once in a while, okay?